Part of a large collection of Elvin Jones’s gear acquired directly from his estate. I had the extreme good fortune to have acquired Elvin’s entire drum collection after he passed in 2004. 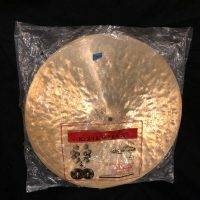 There were dozens of priceless pieces in the collection but some of the true crown jewels were some 1970s K. Zildjian cymbals that were virtually unplayed and still in their original K. Zildjian plastic bags (there are a set of 14″ hi-hats from the same collection also listed on my website). I have never encountered any unplayed K. Zildjians in my 40 years of drum dealing. 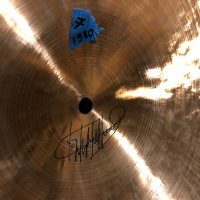 These cymbals were hand selected by Elvin at the Gretsch factory in Brooklyn, NY in the 1970s. Gretsch was the US distributor for K. Zildjian at the time and would allow endorsers to visit the factory to personally select their cymbals. Elvin lived right across the bridge in Manhattan and was a frequent visitor. 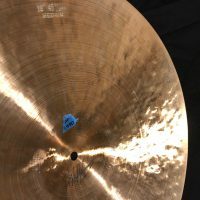 The cymbal is in near new condition. 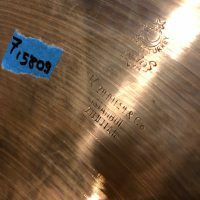 There are some unusual markings on the cymbals that I assume were caused by being stored in the original plastic bag for over 40 years. 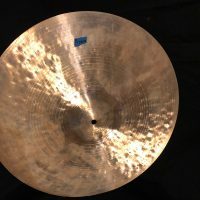 I have not attempted to clean or polish the cymbal. What you see is exactly what it looks like straight out of the bag. 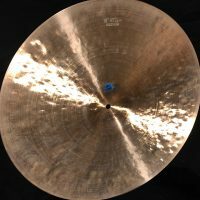 The cymbal weighs 1580g. See and hear the cymbals in the videos below.